When Typhoon Yolanda (known internationally as Typhoon Haiyan) struck the Philippines on 6 November, it left behind a massive streak of destruction and death in the central Philippines. As of 16 November, the authorities counted almost 3,700 fatalities in the Philippines. The storm is a massive humanitarian catastrophe and even the best preparations could not save every life. Countries around the globe pledged money and aid. Even Vietnam, a country with a smaller gross domestic product than the Philippines and which was also affected by the storm, pledged support. It is not surprising then that Israel sprang into action, as it has after so many recent natural disasters, including earthquakes in Haiti and Japan. However, the Israeli army does not quietly and humbly spread tikkun olam – reparation of the world. It brings a public relations team. The choice of the #IDFWithoutBorders hashtag struck me as an unintended irony, because Israel itself is a state without defined borders that has militarily occupied the territory of every neighboring country and presently occupies the Gaza Strip, the West Bank, Syria’s Golan Heights and territory in south Lebanon. Given international condemnation of Israel’s relentless expansion of colonial settlements into occupied territories, it is hard to think of a more unfortunate hashtag from an Israeli propaganda perspective. Lieutenant Colonel Peter Lerner, the commander of the Israeli army’s international media department, even requested that the anti-Palestinian group StandWithUs use the correct hashtag when promoting the army’s relief mission. It took a few days for this unintended irony to sink in, and they stopped using it and it never caught on. The Israeli army’s propaganda departments are aggressively working Facebook, Twitter, YouTube, Tumblr and its blog to inform the public about its relief activities. Most of that content is in the English language, but the Israeli army is also producing French and Spanish language content. One goal of producing so much content would be to inform people back home about the army’s more picturesque activities, but neither English, French or Spanish are official languages of the State of Israel. So which public is the army trying to appeal to? Given the resources devoted to this public relations initiative, one major goal must be to impress an international audience with the Israeli army’s charity and humanity. They have likely made achievements toward that end. 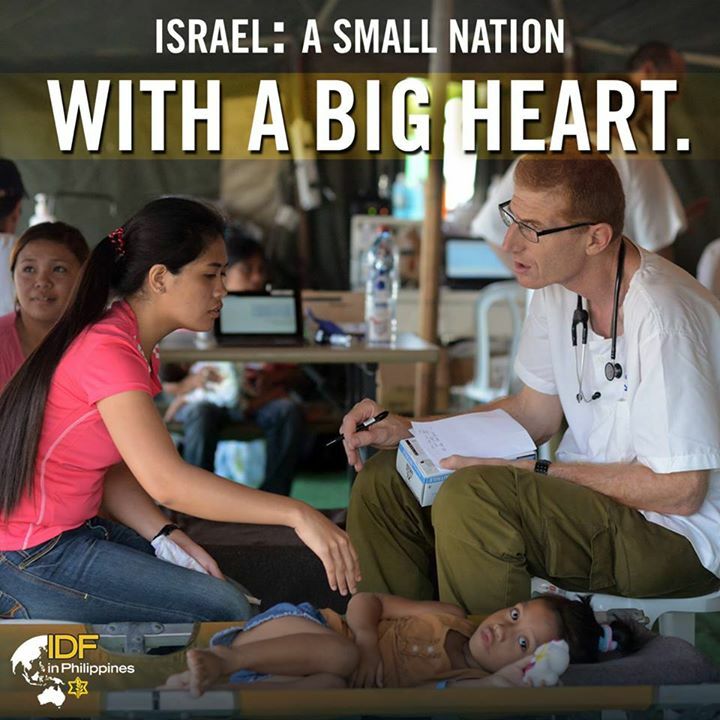 Waking up to see the unbelievable work from the #IDFinPhilippines campaign makes me so proud to be #Zionist. There are now at least two boys named #Israel -- one in Haiti (http://t.co/NrHFGuqu1J) and one in the Philippines (http://t.co/pFYI4LO3G0). There is an explicit connection between Israeli army propaganda and its humanitarian aid to the Philippines. The terms “bluewash” and “bluewashing” have been used to criticize corporate relationships with the United Nations Global Compact to displace negative perceptions of a corporation’s environmental and humanitarian effects. Until the UN, controlled by the five permanent members of the security council, has itself been democratized, it is hard to see how it can claim the moral authority to oversee a transition to democracy anywhere else. This problem is compounded by the fact that Britain, which is hardly likely to be perceived as an honest broker, is about to assume the council’s presidency. A UN mandate may be regarded by Iraqis as bluewash, an attempt to grant retrospective legitimacy to an illegal occupation. Why blue? Because blue is the official color of the United Nations flag and the color of helmets worn by its peacekeeping forces, it is strongly associated with political, international humanitarianism. The term “bluewashing” is of course a portmanteau of the words “blue” and “whitewash,” which is generally a metaphor for censorship of real scandals and crimes. While the Israeli army is contributing to the reconstruction of the Philippines where there is real need, it is also the primary contributor to the worsening conditions in Gaza where electricity is in short supply and clean water is running out. In 2006, Israel killed at least 1,000 Lebanese — mostly civilians — and destroyed civilian infrastructure such as bridges and schools. Israel has never been held accountable for these war crimes. A humanitarian catastrophe in Syria has pushed millions of refugees into neighboring countries, while Israel has made small efforts to provide health care to a few Syrians. The Israeli army’s minuscule efforts to provide relief for a handful of Syrians are over-exposed in the world media, while refugee camps and cities in Jordan, Turkey and Lebanon are overcrowded with Syrians escaping violence. There is no other country that does so little and makes so much noise about it. A key message of Israeli bluewashing is that Israel brings special expertise to solve humanitarian and environmental problems. What this propaganda conceals is the extent to which Israel is directly responsible for environmental catastrophes afflicting millions of Palestinians, especially the pollution and degradation of water resources and the destruction of water infrastructure. The same week that Israeli forces were deployed to the Philippines, Palestinian children in Gaza were wading to school in sewage because of the collapse of infrastructure due to the Israeli blockade. In the West Bank, on top of severe water shortages caused by Israeli exploitation of water resources, Palestinians are frequently victims of settlements dumping their sewage on their farmland. An Israeli army propaganda video from 2012 demonstrates the brazen, exploitative nature of Israel’s bluewashing strategy. At the very end, a quote is displayed by the Jewish philosopher Maimonides. He who saves one life saves the world. Whoever destroys a soul, it is considered as if he destroyed an entire world. And whoever saves a life, it is considered as if he saved an entire world. Israel’s bluewashing in the Philippines does not make us forget the souls it has destroyed. I wonder if any of these kids that Israel says it's helping now are some of the hundreds Netanyahu deported in 2010 in order to "defend Israel's Jewish identity"? is it me or does #idfwithoutborders sound funny and ironic? sure it does not sound funny.it actually sounds scary...if given the chance they will invade and occupy.a nation walking around the globe with fire in one hand and water in the in the other hand in case they they get caught. Stealing passports and IDs from the dead, just like in New Zealand after the earthquake, to use by Zionist assassination squads. Thats why the NZ government didn't want them, but they came any way and had to be kicked out. Dante once said that the hottest places in hell are reserved for those who remain neutral in times of great peril. After seeing this, I find it hard to believe. To start, the point raised by Andrew is very important. The Zionists were busy, over the last few years, expelling many migrant workers and their families (including a sizable amount of Filipinos) from Israel on purely RACIST reasons (i.e. the Zionist regime working to "preserve" the disgusting, herrenvolk, ethnocratic so-called "Jewish state" and its' constant obsession with demographics). After noting that, I was reminded of the statements and writing back in 2010 by Israeli doctor Yoel Donchin. Dr. Donchin discussed, from his own personal experience, how the Israeli regime actually often removes significant amounts of "humanitarian goods" to replace them (on the airplane) with more room for media officials and camera crews (i.e. for that extra hasbara)! Dr. Donchin also made a very insightful point noting that the Zionist regime only seeks to get a "public relations" (aka hasbara) gain out of something for a quick brief second; that is chiefly RIGHT AFTER the situation has happened (i.e. when it is still in the front of the world media). After that the criminal Zionists are no where to be found of course. As Dr. Yoel Donchin himself said: "Israel is usually the first to arrive but also the first to leave." Mr. Doherty's quote "There is no other country that does so little and makes so much noise about it" just about sums up the pathetic Zionist hasbara detailed in this article.